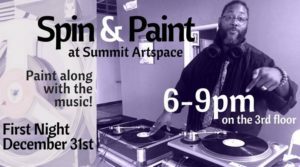 Summit Artspace – 3rd Floor Event Space, 6-9 p.m.
“Spin & Paint” from 6-9pm! Ace Epps will be spinning records while artists instruct painting sessions inspired by the music they have selected. From 6-7pm, 1960s Classic Rock, with artist Miriam Daniel instructing participants to create a new twist on the classics. From 7-8pm, Indie Alternative Rock, with artist Nikki Bartel instructing participants to paint movement and flow with the music. From 8-9pm, Classic Jazz, with Megan Milvet instructing participants to paint a Downtown Akron cityscape inspired by jazz music. Participants will be encouraged to react to the music and create a finished painting within about 15-20 minutes. Other First Night Events at Summit Artspace on East Market! 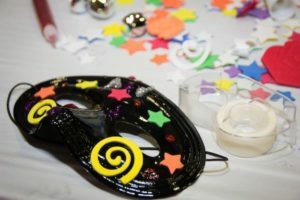 Summit Artspace – 1st floor Transition Gallery, 6-9 p.m.
First Night’s favorite make and take activity is back and in a new location! With sequins, feathers, and beads, you’ll find the perfect combination to create a masterpiece. 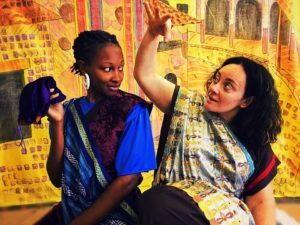 Summit Artspace – 2nd floor, 7-8:30 p.m.
Two weavers promise the Emperor they can make the most magnificent clothes using magical cloth. When he gets his new wardrobe from them, the naked truth is, the Emperor looks very silly indeed. Come watch short scenes and participate in interactive workshops with the cast. Buttons are $10 with children 9 and under admitted free with a button-wearing adult. Buttons are on sale at Acme Fresh Market (locations), Huntington Bank (locations), Akron Art Museum, Akron Civic Theatre, Angel Falls Coffee Company (Highland Square) and The Library Shop on Main. First Night Akron couldn’t happen without the generous support of the event sponsors. Thanks to many community foundations and businesses for helping make this event happen.